Cambridge in England ought to be twinned with Varanasi in India. Everywhere you look there are cows. They nuzzle picnickers sitting next to the river Cam, block foot paths near the center of town and amble behind the colleges. 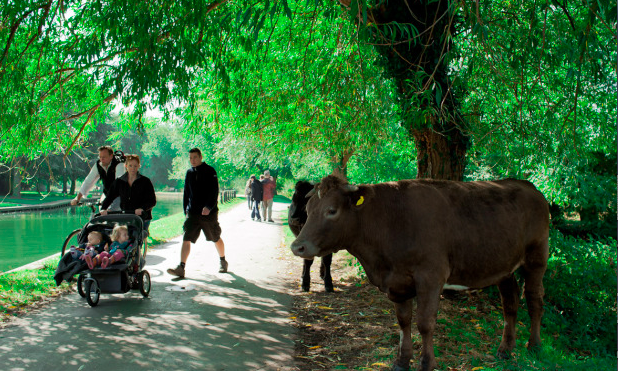 Yesterday, I had to meet some work colleagues in London, so I cycled off to catch the London train and just 5 minutes from the station, there were 15 cows standing immobile in the middle of the path. I edged nervously between one cow’s rear end and a brick wall and was just congratulating myself on my nifty maneuver when I sank ankle deep in cow poo. I missed two trains trying to clean up in the station loo. Luv it! But leave the pooh in Cam—-don’t bring it here!